Such has been called the burning of food crops to produce biofuels. Liquid hydrocarbons are unmatched as transportation fuel. Using hydrocarbons to process biomass into transportation fuel is detrimental to civilization’s energy balance and must be avoided. 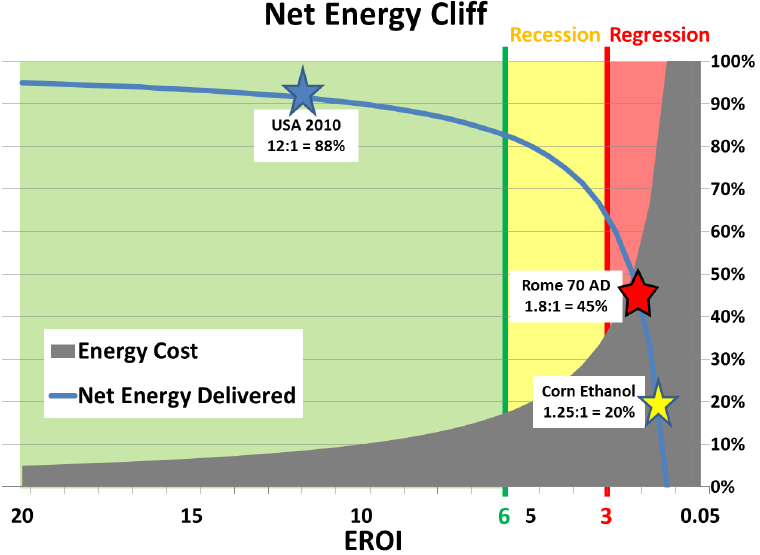 Not even today’s best liquid biofuels have any prospect of simultaneously attaining the 6:1 EROI (Energy Return on Investment) necessary to support a healthy modern civilization while also achieving the massive yields per acre necessary to supplant any significant fraction of the national energy supply. Petroleum and natural gas are true primary energy sources and fuel modern agriculture. The use of petroleum to accelerate energy crop growth is ludicrous on its face, as the result is less overall efficiency of energy and greater net consumption of petroleum. The best use of agricultural land and water is to produce sufficient food for the United States and a surplus for the rest of the world. The only sensible use of biomass as fuel is to harvest unfertilized biomass from unmanaged land and consume it as is (e.g. firewood) without wasteful attempts to transform it into liquid fuel. Mandating the use of higher-EROI fossil fuels to make lower-EROI biofuels requires the overall consumption of more energy to deliver the same power output. Current U.S. biofuels policy is accelerating rather than decreasing the use of fossil fuels. “We must understand that a national energy strategy is nothing less than a national survival strategy.” Is it not obvious that all subsidies and mandates for biofuels, including ethanol, should be ended as quickly and expeditiously as possible? This entry was posted in a crime against humanity, biofuels, energy return on investment, EROI, ethanol, national energy policy and tagged biofuels, energy return on investment, EROI, ethanol, Global warming, jack heidel, national energy policy by jackheidel. Bookmark the permalink.